Thanks and appreciation to the team at Oregon Aero. They rebuilt, with FD permission and proper authorization, one of my two seats. I am so pleased I am sending in the second seat. You'll see the incredible difference between the two in the attached photo. Let's face it we love our LSA's but it takes longer to get where we're going compared to what many of us used to fly. In my case it was a Columbia 400. The CT's 105 knots is quite a bit slower than the Columbia's 180 knots however, the economy and pleasure of flying my CTLSi is worth it. At the stage in my life/flying hobby, I am almost ready to retire. Being able to stay in aviation with something affordable was paramount but so is comfort while in the air for extended periods. Thanks again to my new seat design by Oregon Aero. The seat rocks, I want one, how much? I had mine done back in 2010 and my hangar mate with a CT did to. It does make a difference. I got grey and he got red. He finished all the leather in the cockpit red. Came out really nice. I bought a cow hide (your choice of colors) and took it to a classic car upholstery shop. With the price of the hide and the labor the seats cost me $800. Being lift up in an LS is good because you sit lower anyway. If you made a seat for an SW as thick as the one in the picture it puts you up above the spar box. Mine were 2" and I'm 6'1". My head was just a tad above the box, but did not interfere with anything. It wouldn't cost FD Mfg to have a better seat when it's being Mfg'ed. It does a better job of spreading the weight across the entire seat with a tad of padding. FD LS seats are hard. Roger was that $800 for two seats or just one? I'm 6'1" also with a pretty long torso, I'd be afraid to go too tall on the seats. Maybe half as much height gain as what Ivpazik posted. Also curious to hear what Ivpazik paid if he'll share it. 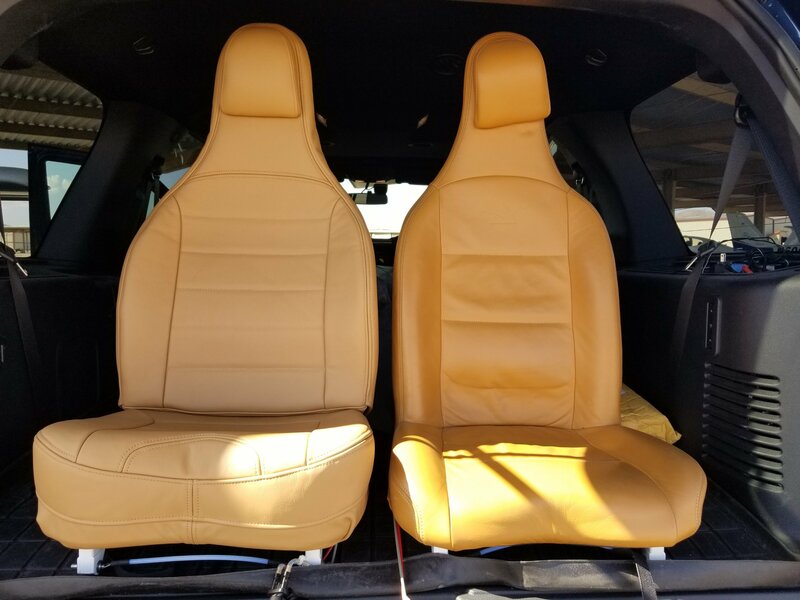 IMO the seats are one of the weak areas of the CT.
$800 for the pair. Just purchase a full cow hide (approximately 55 sqft) in the color you want. Take it to a auto upholstery shop. I feel like our CTLSi also has a cruise speed of about 105 knots. The summer is pretty rough here in the south, so I haven't been able to pinpoint the cruise speed exactly. I'm ready for some cooler air this fall so I can start adjusting the prop. I kind of thought we had a dud with the 105 knot speed, but at least now I know there is another with the same speed. How do you determine 'cruise' speed? For me, especially since I cruise well above 7,500'DA Cruise speed is what I get in level flight with a wide open throttle. My prop pitch allows 5,500RPM @ 10,000'. Its not unreasonable to cruise at reduced RPM but if its bringing you well below 75% power then you won't realize the speed. 105 kt true, or indicated? Mine cruises at about 119 to 120 true, but obviously indicated is lower. If it’s true AS, I wonder if something’s not right in the way the its being calculated. Could whip out your E6B and check it. 105 to 107 TAS seem to be pretty common according to the Dynon Skywiew at about 5200 rpm. We got the plane just before summer and all the flying I've done so far has been in 90 degree heat with lots of turbulence. It seems like there is always a headwind too. I am ready for some smooth air this fall and winter to really dial in the airspeed and rpms. I feel like the prop may need some adjusting, but don't want to start with that until after we get some smoother air. I feel like the propeller pitch has been set by Flight Design so it will not allow me to get into the yellow or red area. the highest RPM I have ever seen is about 5350 and that was when the airplane was getting pushed down in a downdraft. In a downdraft if you try to maintain altitude your RPM will slow down, not speed up. If you try to maintain altitude with an updraft your RPM will go up. You are likely correct that your propeller has to much pitch. Your prop has way to much pitch. To realize best speed you need 7,500' DA, so look for and optimize for speed as high up as you can. 5,200 @ (throttled back) < 5,350RPM @ < 7,500' DA = ~ 55% power, increase power to 75% to find good cruise numbers! 5350 is over pitched. Anything under 5500 is over pitched. There are NO redeeming qualities with an over pitched prop. You lose everything. Climb, cruise (cruise sped and top speed), fuel economy and higher engine temps. Set the prop pitch to achieve around 5600-5650 rpm at WOT at your AVERAGE altitude. This is the best balanced pitch setting for climb, cruise, fuel economy and engine temps. If you only see 5350 take 1 degree out of the pitch and try it. Thanks for the advice. By the way, those seats are awesome! Sorry I hijacked the thread. Where is the best place to buy a Neuform Adjusting Gauge? Order a Warp Drive propeller protractor. If you PM me your email address, I will send you a detailed instruction sheet (with pictures) on how to re-pitch that I created some time ago for another member. Is this approach Neuform specific or would it work for other props ( Duc ) ? Flying Monkey, I'd love a copy of the prop adjustment instructions if you have them. My email address is andy@andersonoilcompany.com. I'm going to order the prop protractor you recommended now. I tried to PM you, but for some reason it said you couldn't receive messages. I made my own angle measuring fixture, using a digital level to actually measure the angle. I posted a picture on here some place. There is a picture of my homemade fixture in this thread. You can use a prop protractor or just use a rubber-band to hold on a 12" digital level. I use both when I adjust a prop. I just installed a new Sensenich 68" 3 blade on a Tecnam that had a 68" fixed pitch 2 blade that only allowed 5200 rpm WOT. What a difference. Prop set to get 5650. I tend to like a little more precision that a rubber banded level. Not having the blade leveled in the same position, or not having the level in the same exact position from center of the prop hub can cause errors in setting the pitch. Roger, it has been my experience that if you off just a little in horizontal position of the blade and positioning of the level that the blade angles will not be as accurate. I can also do it in less than 30 minutes, and within 1/10th of a degree accuracy per blade. My fixture allows me to have the blade in the same horizontal position each time, while keeping the level in the same position and skew for each blade. If I remember right that thirty minutes did not include spinner off/on? Yes it did and I didn't have any tools out. I had three timers.